We all have people we’ve lost. People who we wish we had said, “I love you” to before they died. Without having said those words, we may not ever feel a true sense of closure. Think about the many hospital team members who treat and care for patients, sometimes for a short time, sometimes for much longer. Patients leave the hospital every day, and unless the team keeps in touch with the family, or receives updates from others who know them, they don’t always know what happens to patients. “We are a subway stop for lots of people,” one caregiver shared during a recent Schwartz Rounds at Memorial Hospital. The forum addressed the topic of closure, and how it isn’t always an option. “We don’t get to find out the end of the narrative that we crave as humans. I’m not sure I get much closure, ever,” one physician admitted. 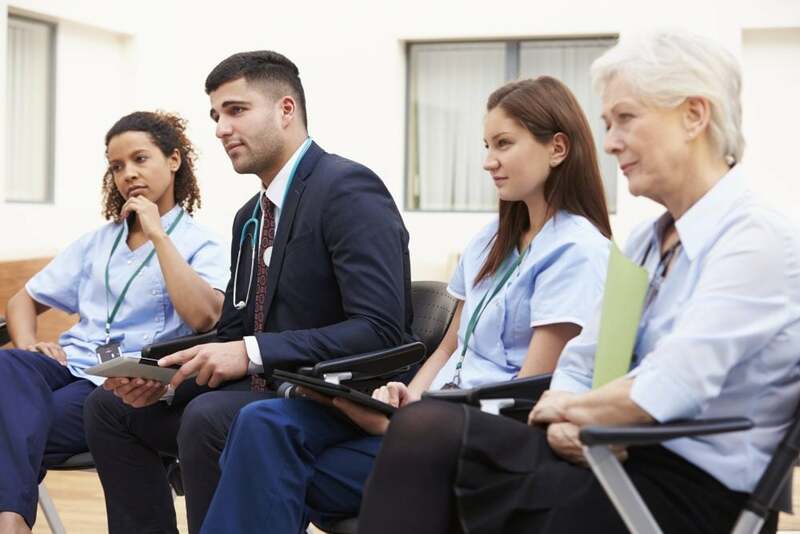 Schwartz Rounds is a multi-disciplinary structured forum where associates can discuss social and emotional issues that arise when caring for patients and working in the healthcare setting. The forums, held at both Memorial and Elkhart General, are meant to nurture compassion and provide emotional support for caregivers. Schwartz Rounds are open to all Beacon associates, clinicians and trainees. CMEs, nursing contact hours and LiGHT points are available for attending at either site. The forums, which are not open to the public, address such global topics for caregivers as social media concerns, giving a patient a tough diagnosis, and finding closure after a patient leaves the hospital. “Sometimes it’s talking to the staff and acknowledging how we came together for that patient and did the best we could,” one associate said about how she strives to find closure. Another associate explained how she’s constantly working through the inability to feel closure with patients who leave the hospital. Volunteers also suffer sadness and grief when they don’t feel closure. Consider those volunteers who donate their time to sit with patients who are alone, who are dying, and who don’t have anyone else to be with them because family is rushing to their side from far away. Volunteers who leave after families arrive oftentimes never know what happened to the patients they spent time with. Discussion Points: Panelists will explore the various motivations of why they went into healthcare, why they remain and what would cause them to change careers. Various generations generally respond differently to these short statements, and our panelists represent different generations. They have been asked to reflect on the following questions and statements and will be ready to share their story: Each person has his or her own reasons and ideals that guide their decisions. What happens when reality clashes with our ideals? How do we respond, how do we recover, how do we stay motivated? We talk about resilience — how do we recover?